The dry valleys of Antarctica form the coldest, driest, and windiest ecosystems known. Robert Falcon Scott, one of the earliest explorers of the McMurdo region of Antarctica, referred to the McMurdo Dry Valleys as the "Valley of the Dead" during his first visit in 1903. Recent studies in Antarctica have yielded new information about the presence of microbial life in soils, sandstones, melt water ponds, and the ice and liquid water columns of permanently ice-covered lakes, proving that the valleys are not dead as Scott had believed. Most of the microorganisms found in these habitats are prokaryotic and thrive in what would otherwise appear to be an inhospitable environment. Why study microbes in permanently ice-covered Antarctic lakes? The valleys harbor the only permanently ice-covered lakes on Earth. The permanent ice covers greatly reduce (1) wind-driven mixing (2) gas exchange between the atmosphere and the water column (3) light penetration and (4) the deposition of sediments. The lakes are also controlled by seasonal shifts in the light regime (6 months of light and 6 months of darkness), which uncouples photoautotrophic and heterotrophic processes. 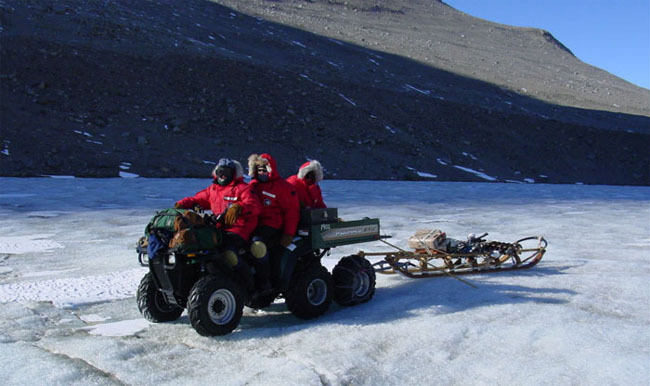 Since 1992, the McMurdo Dry Valleys have been the site of a long term ecological research (LTER) project. There are 26 LTER sites across the United States and Puerto Rico. 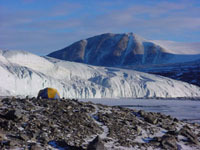 The McMurdo Dry Valleys LTER Project represents a region where life approaches its environmental limits, and is an "end-member" in the spectrum of environments included in the LTER Network. Research is focused in four areas: microbial ecosystem dynamics in arid soils, ephemeral streams, and closed basin lakes; resource and environmental controls on terrestrial, stream and lake ecosystems; material transport between aquatic and terrestrial ecosystems; and ecosystem responses to hydrologic flux driven by the warming climate. Research interest in microbial studies is extensive within the LTER Network, and coupled with the LTER and Microbial Observatories projects in the McMurdo Dry Valleys provides for an exciting synthesis of research.